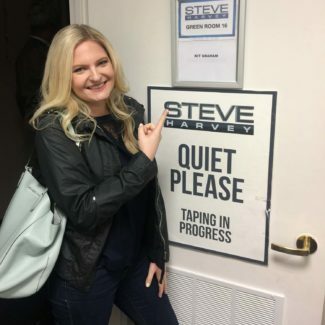 I made these Mini Quiches for my appearance on the Steve Harvey Show! 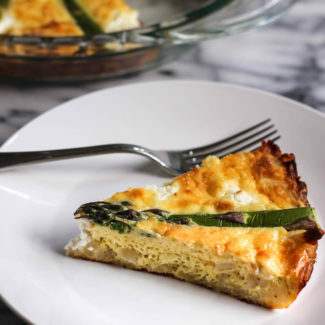 I knew that I would be talking about my recipes for Roasted Tomato and Mozzarella Quiche and Mushroom, Asparagus, and Cheddar Quiche on the show, and when the producers of the show saw the photos they wanted to try it themselves! 24 hours before my call time, they called and asked if I could bring as many mini quiches as possible with me to the show’s taping. 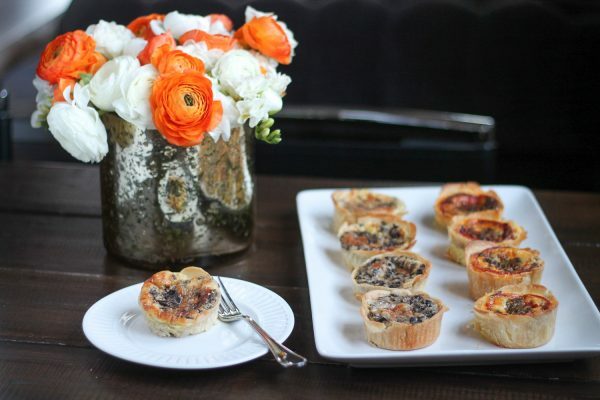 Luckily, quiche is quick and easy to make, and I was able to make 126 mini quiches to bring to the show. 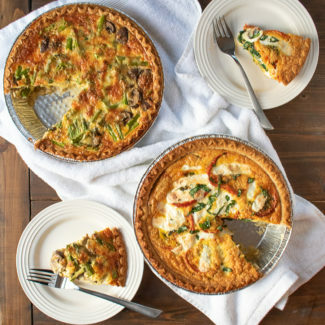 While the recipes for the traditional pie sized quiches are already on the site, I thought that the viewers of the Steve Harvey Show might want to know how to make Kit’s quiches from the show. 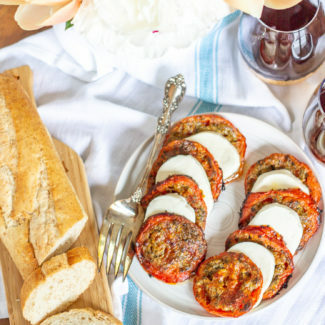 You will find the exact recipe at the very bottom of this post – along with recommendations for some of my favorite brunch recipes. 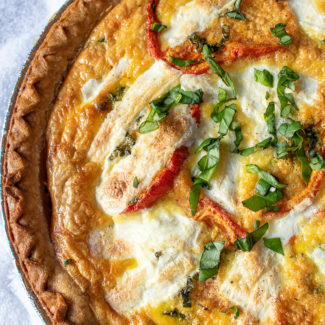 The eggs in these quiches have a light fluffy texture. The secret is to whip the egg, milk, and cream mixture until it is light and frothy. It prevents then egg from being too dense. The cheese melts into egg complimenting the veggies and adding a cheesy flavor to each bite. 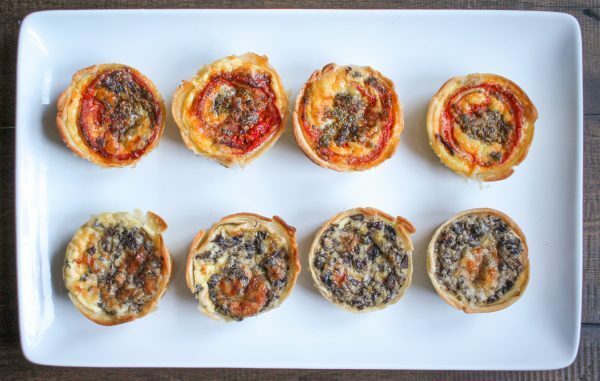 The recipe below yields 10 Roasted Tomato, Pesto, and Mozzarella Quiches, and 10 Mushroom and Cheddar Quiches. The mushroom cheddar quiche is easier to make since you just pour all of the ingredients into the pie crusts and bake them. The active preparation time is only 10 minutes. 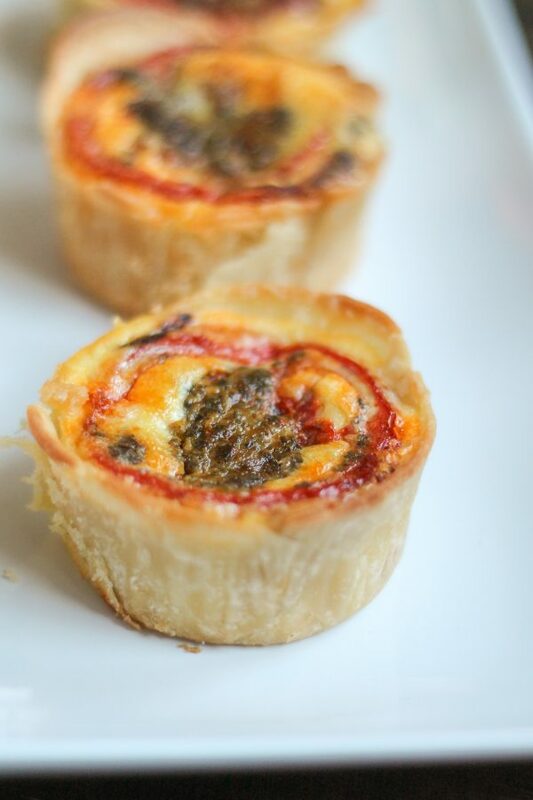 The Roasted Tomato, Pesto, and Mozzarella Quiches take a little longer to make since you have to roast the tomatoes. This adds about 20 minutes to the preparation time. I simply brushed slices of tomatoes with store-bought pesto. 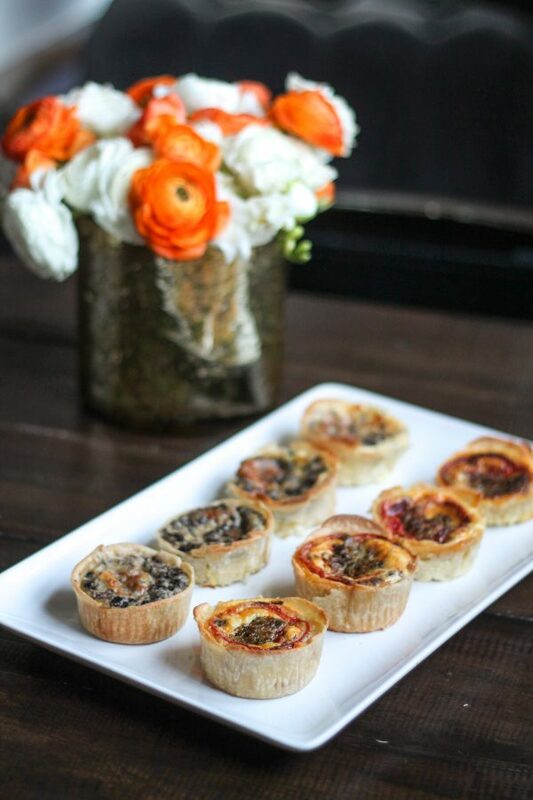 I love how the roasted tomato slices look on top of the individual mini quiches. You can use this technique of roasting tomatoes for other recipes too. I used 4-ounce disposable aluminum foil ramekins to make the quiches. I think that they are just the perfect size to serve at a brunch. First, you need to roast the tomatoes. Slice 3 of the medium tomatoes into 10 slices about 1/4 of an inch thick. Chop the remaining 2 tomatoes. Lay the tomato slices out on a piece of parchment (this is important because it prevents the tomatoes from burning - just a little bit of the juice that oozes out of the tomatoes burns but it falls right off the tomato). Place the chopped tomatoes in a pan lined with parchment and add about a tablespoon of pesto and stir to combine. Place all of the tomatoes in the oven to roast for 20 minutes. While the tomatoes are roasting, prepare the other ingredients. You can slice the mushrooms but I love to chop them up real fine. 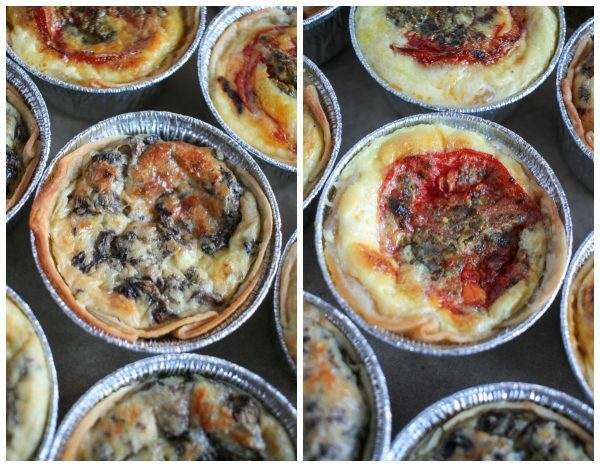 It makes sure you get a bit of mushroom in every bite, and it gives the quiche a great texture. Then prepare the pie crusts. Unroll the pie crusts and use a biscuit cutter to cut 8 circles from each pie crust. Then roll out the remaining dough and cut another 4 circles. Then you want to take your rolling pin and roll out each circle of dough until it is 1/3 bigger. Then place these dough circles in the 4-ounce aluminum foil ramekins. 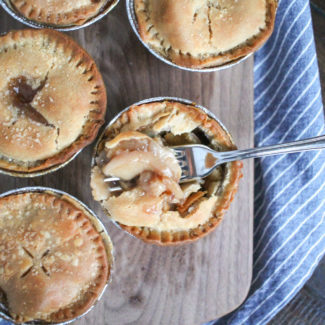 Divide the chopped mushrooms between 10 of the prepared pie crusts. Top with the cheddar cheese. Then prepare the egg mixture. Crack the eggs into the bowl of an electric mixer and add the milk, cream, salt, and pepper. Start on a slow speed for a minute, and then increase the speed to high for a minute so that the eggs get frothy. Remove the roasted tomatoes from the oven. Divide the chopped roasted tomatoes between the remaining 10 ramekins. Top with the mozzarella. Then divide the egg mixture between the ramekins. Finally, add a roasted tomato on top of the roasted tomato quiches. Place the ramekins on a parchment lined baking sheet. Bake for 30 minutes at 375 degrees. Then increase the heat to broil to brown the tops of the quiche - keep an eye on the quiche, this should only take about a minute. 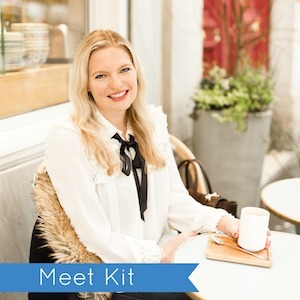 Want to check out some of my favorite brunch recipes? Here you go! 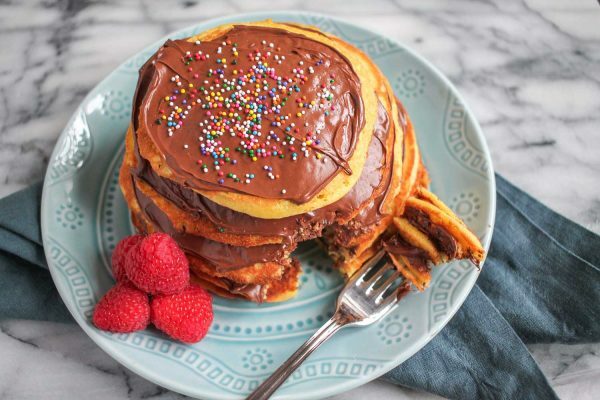 Cupcake Pancakes – Pancakes taste even better when they are made with cupcake batter and topped with nutella. 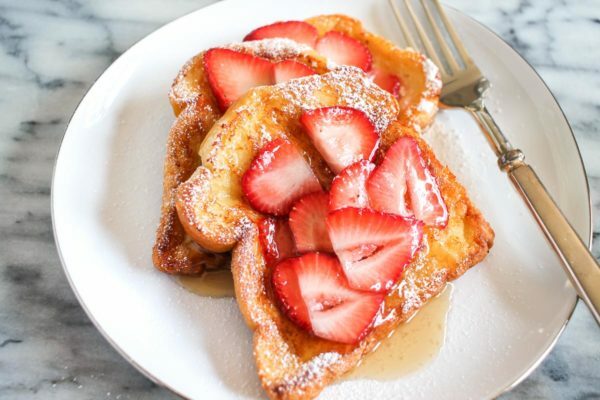 French Toast made with Melted Ice Cream – Using melted ice cream to make French Toast is a time saving hack and a delicious treat. 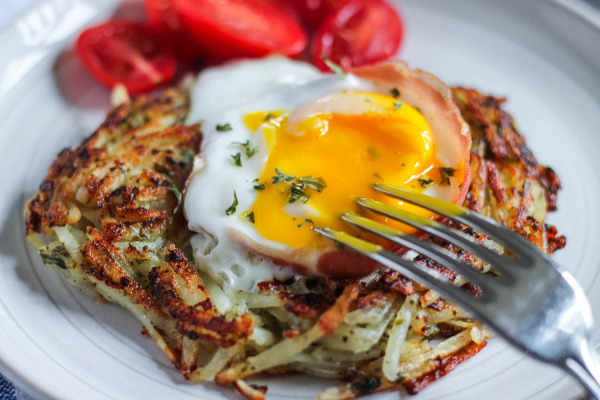 Eggs in Hash Brown Nests – A runny egg sits in a nest of hash browns seasoned with pesto and a slice of prosciutto. It’s the best parts of breakfast combined. 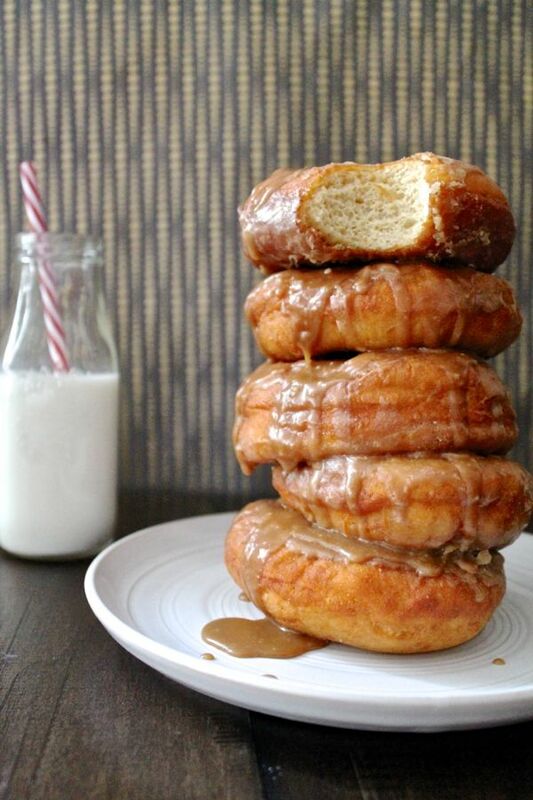 Caramel Doughnuts – Is there anything more decadent than homemade doughnuts? 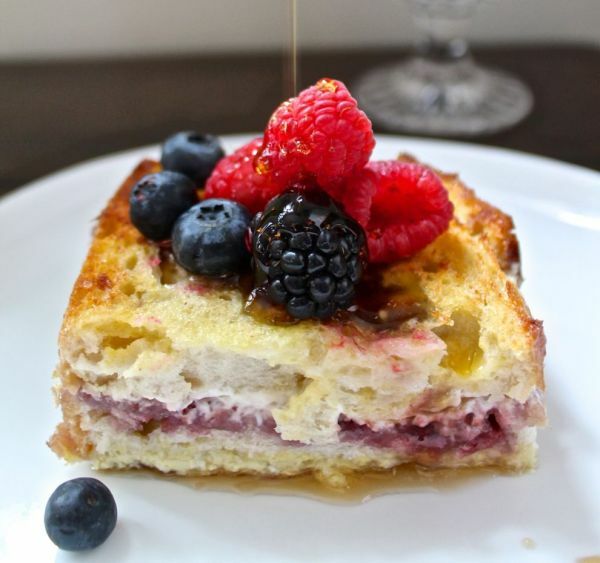 Berry Stuffed French Toast – This is a perfect recipe to make if you are hosting a crowd. This berry stuffed french toast is filled with jam and cream cheese and takes just minutes to assemble in a casserole dish.